We have teachers all over the glove. These are individuals that attend training courses in the UK and groups that have invited us to train in their country. You may wish to attend one of our UK Training programmes, as have many of our previous students, then please look at our Courses. However, if you would like us to bring these programmes to your organisation at a mutually convenient time, thereby reducing delegate travel time and accommodation costs, please see our ‘Co-ordinating International Training’ page. Please read the article below of our experience of teaching professionals in Bucharest, Romania in October 2008. Last month many of you would have seen the ITV documentary where Sarah Ferguson and her young daughters visited Romania and Turkey undercover to investigate the institutions in which many abandoned children and adults find themselves in. This programme was a chilling reminder of our own visit to Romania only the week before. As you know, Pauline and I spent a week in Bucharest teaching infant massage to a number of professionals that work with abandoned babies, disabled children and young, single mothers. We recently collaborated with the psychology department at Dundee University on a small research project looking at the benefits of infant massage and it was Dr Zeedyk who introduced us to the work of Emanuela Chiritescu in Bucharest, Romania. Emanuela gave up her career in teaching a few years ago to form a charity to help care for the many abandoned babies in the hospital in her district in Bucharest and work with foster parents who look after the abandoned babies. She then went on to open up a Maternal Centre with 8 places for single mothers who ordinarily would have abandoned their babies at birth and left them for the state to rear in an orphanage. Emanuela is a determined and resourceful woman who raised the funds from donations in Romania and abroad as well as some government funding. Even since the demise of Ceausescu’s oppressive regime, where he banned the use of contraception, Romania still has a culture where there is little and in many cases no education about contraception. This has resulted in Romania having the highest rate of abortions in the world and pro-life groups have been campaigning for mothers to continue with their pregnancies. However, there is still a huge stigma attached to single mothers and many are disowned by their families when they find themselves pregnant. It has long been accepted that unwanted babies, for whatever reason, are given up to the state to be reared. The government is working with families to foster and adopt many of the babies, but this process is quite lengthy. This is hindered beyond belief if a child has been abandoned in hospital and its mother hasn’t registered the birth. The adoption laws are quite tight now in Romania and the government is duty bound to find the mother or her family for a year before a baby is then allowed to be adopted. These abandoned babies remain in hospital until a suitable foster/adoptive family is found or they move to an orphanage. They are desperately in need of love, stimulation and positive touch to help them thrive and many are not receiving this unless it is from volunteers working in the hospitals. Many of the children who have been abandoned and grow up in orphanages have real difficulty with the state-run homes and often run away, preferring to manage their own lives by begging for money and living on the streets of the city. Our first encounter of such street children was within 20 minutes of leaving the airport. We were at traffic lights and as soon as the lights turned red the dirty, undernourished little children appeared from nowhere, holding puppies close to their skinny little frames, partly for warmth, partly to appeal to the softer side of their potential benefactors. Our guides offered biscuits and fruit, but no money. All the people we asked about these children were rather cynical, commenting that the children struggle with discipline in the homes. It was a sad indictment of the fate of some of the abandoned babies. 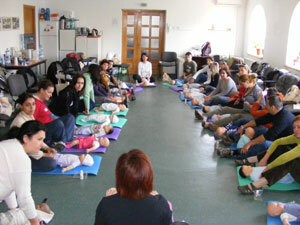 Emanuela’s vision has been to help babies so that they do not ultimately fall into these terrible situations. She was very keen to learn about infant massage and could see the huge benefits of its use with the abandoned babies in hospital and for the babies and mothers in her Maternal Centre. After much discussion Pauline and I agreed that we would offer our services free of charge to 24 similarly minded people in the capital city as there is no money for such training programmes. We developed a slightly longer programme based on what we teach in the UK and many of our friends, colleagues, family and former students pledged donations towards the cost of the training resources and for this we are very grateful. Thank you. We trained GPs, health visitors, physiotherapists, social workers, therapists working with disabled children, educators and volunteers from Maternal Centres and volunteers working directly with the abandoned babies in hospitals. The trainees were super and were extremely grateful for the chance to learn a practical skill that will help them with the mothers and babies. They were stunned by the knowledge they gained about how vital it is for a baby to receive positive experiences and loving touch within the first two years of its life. On a lighter note, we had real fun and we even taught our students many British nursery rhymes! Listening to 24 Romanian adults singing ‘this little piggy went to market’ was hilarious! All in all, the trip was an emotional rollercoaster for both of us, but we are extremely glad we went.